Santa Clara Pueblo v. Martinez nakedly presents a conflict between the individual rights norm of equality and the communal or collective political right of the first sovereigns within U.S. borders. The conflict underlies the discourse in law scholarship and reflects disparate cultural visions between mainstream society and American Indians. In Indian law the decision has saliency with positive and negative force injected into different arenas besides equal protection, gender, and membership qualifications. It is a major fortification for the federally recognized tribal sovereigns to exclude external law and forums, the federal law and courts, in how tribes exercise self-government. 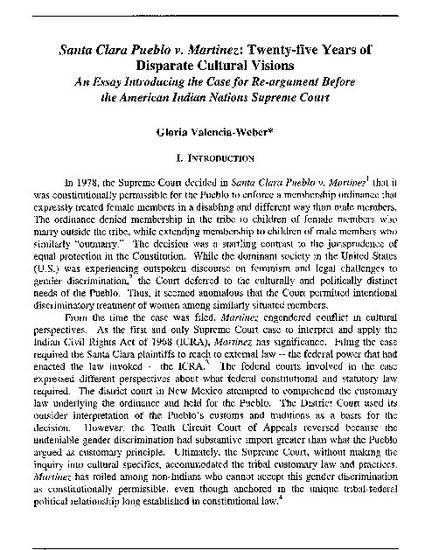 The case continues to provoke criticism for the Santa Clara Pueblo people who have not changed the ordinance that discriminates against female members who outmarry. Numerous people want a world of law with constitutional equality as the norm. Yet some of these people are also sympathetic to the need to correct the unfair historical treatment suffered by tribes and support efforts to protect the indigenous culturally and politically distinct way of life. The desire to reconcile the two perspectives is frustrated by reality, what Justice John Marshall called the "actual state of things." Understanding Pueblo life "then," when Martinez was decided, and "now" does not make the dissonance disappear, but it can inform a wider perception of the issues at stake.